Isley, V., Smith, P. and boredomresearch, , 2008. Real Snail Mail. RFID internet installation.Gijon, Spain: UNSPECIFIED. boredomresearch exhibited the Real Snail Mail installation in Process as Paradigm Exhibition, LABoral Centro de Arte y Creacion, Gijon Spain (23rd April - 30th Aug 2010). A group exhibition which is showing artwork that is continually evolving and in a state of flux. the exhibition includes artworks by Ralf Baecker, Gregory Chatonsky, Peter Flemming, Roman Kirschner, C.E.B. Reas, Antoine Schmitt and Ralf Schreiber. Vicky Isley & Paul Smith (aka boredomresearch) in 2009 developed an installation version of their project Real Snail Mail (www.realsnailmail.net). The world's first webmail service to use live snails to deliver messages. 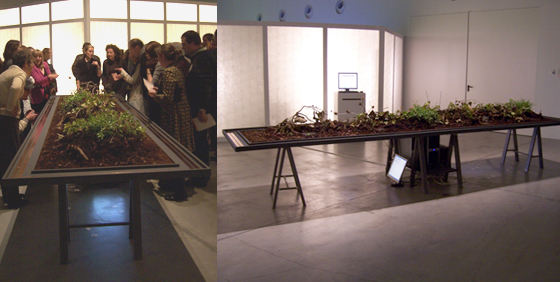 The Real Snail Mail installation enables an audience to view the webmail service live and the RFID tagged snails housed within an exhibition open top table enclosure, with multiple RFID readers, substrate and planting.